Austerity was meant to be over by now in the UK. The country living comfortably within its means. The books balanced. But, with the Coalition government consistently missing its deficit-reduction targets, this is clearly not the case. We’ve had five years of austerity and, with the recent election of a Conservative majority government, we are nailed on for another five. So, rather than slipping from the top of the political agenda with the job done, the election has reinforced the importance of being seen to deal with the deficit. Patrick Wintour’s fascinating and in-depth look at Labour’s election strategy, for example, claims that one of Labour’s central problems (along with the rise of the SNP) was its muddled and unconvincing position on the deficit. In amidst of the battle over Labour’s future economic strategy, it might be important to consider what the public think about those first five years. Luckily, YouGov have tracked public opinion on austerity, asking a representative sample the same set of questions several times a month over those five years (‘Thinking about the way the government is cutting spending to reduce the government’s deficit, do you think this is…’). This data, presented in charts below and analysed in of groups of two, tells us about public opinion, of course, but is also suggests some central insights into austerity itself. In many ways, austerity is a battle over ideas. For those on the progressive Left who broadly subscribe to a Keynesian doctrine, austerity is a flawed and dangerous idea. Cutting in a slump doesn’t work because demand is dampened and growth stagnates. Therefore, it was just a matter of time before austerity unravelled, opponents were proved wrong and a Keynesian alternative prevailed. Never mind the relatively acceptable growth figures, the first chart highlights how this battle over ideas is being lost by the Keynesians in respect to public opinion. Somewhat counterintuitively, the amount of people who believe austerity is good for the economy actually increased between 2011 and 2015. 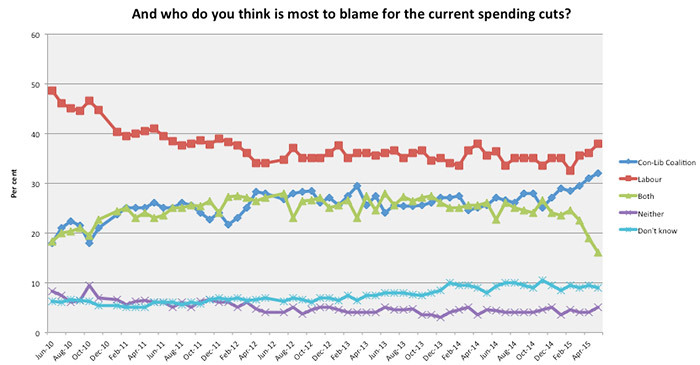 In comparison, the attribution of blame for spending cuts has been relatively consistent over time after an initial dip in those blaming Labour. Given the tenor of public debate over this period, it is perhaps unsurprising to see Labour receive the most blame for current spending cuts. On the other hand, this reflects how utterly entrenched dominant narratives of austerity have become. It is worth reiterating that only around 30% of people blame the government that actually introduced and implemented spending cuts for those cuts! Although the ‘Labour Debt Crisis’ narrative propagated by the Conservatives contained many falsehoods, it clearly hit the nail on the head with respect to New Labour’s flawed approach to tax and spending. When aggressively confronted about his party’s ‘overspending’ during a pre-election Leaders debate, Ed Miliband infamously claimed it hadn’t. This response was equally as brazen as Tory attempts to blame the global financial crisis on Labour mismanagement, its plausibility relying on ambiguous wording. If ‘overspending’ means spending more than you have coming in, then Labour is guilty as charged; but, if ‘overspending’ means wasting money on unnecessary and luxurious goods and services, then it is a value judgement. Ambiguity can be used to advantage, but in this particular case its use came across as arrogant, delusional or even deceitful. That’s not a good look. The two charts above hint at the public experiences of austerity. 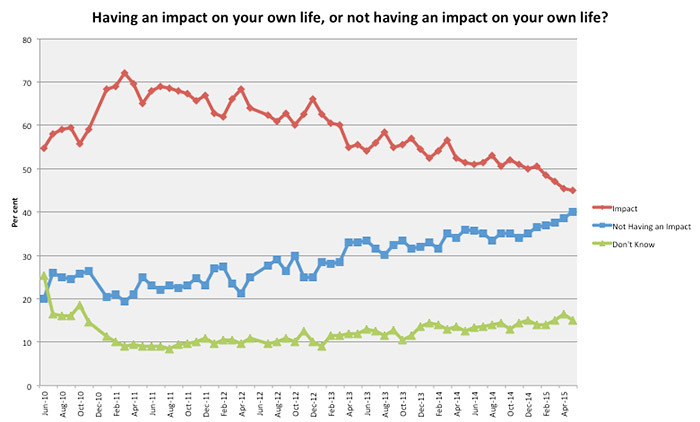 Together, they show that in early 2011 a majority of people indicated that cuts were being introduced too quickly and that they were having an impact on their lives. 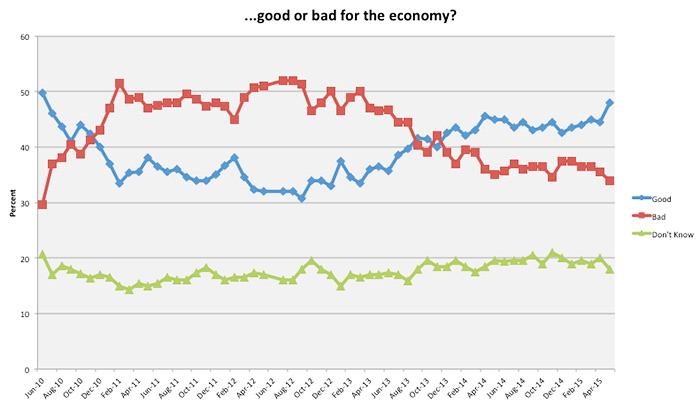 This might point to an initial underlying unpopularity for austerity measures. While perhaps true, it is the direction of travel from that point that is most interesting. For instance, 70% people said austerity cuts were having an impact in early 2011, but this figure then steadily declines. Indeed, if this trend continues, then those reporting ‘not having an impact’ will soon overtake those reporting ‘impact’. This is odd. Any political scientist worth their salt will be able to tell you that institutions are difficult to reform and spending commitments are difficult to take away. Consequently, spending cuts can take years (or even decades) to implement on the ground. As the Institute of Fiscal Studies wrote in February 2012, ‘only 12% of the planned total cuts to public service spending, and just 6% of the cuts in current public service spending, will have been implemented by the end of [the 2011-12 financial year]’. We would therefore expect the impact on the lives of the public slowly to increase over time, and for public opinion to mirror that. This apparent discrepancy can perhaps be explained when we take into account the tempo in which cuts have been introduced. 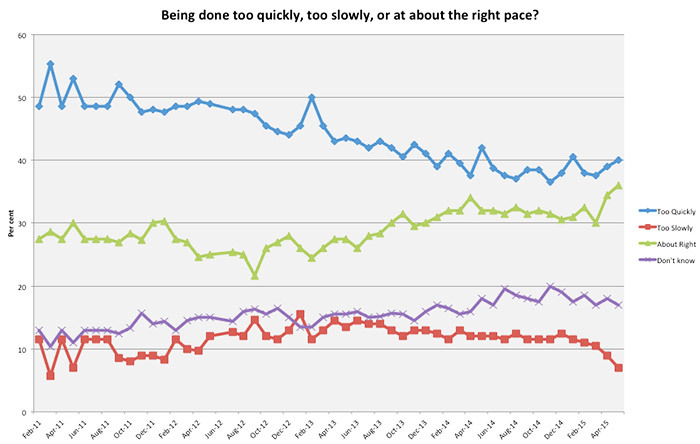 Analysis of George Osborne’s budgets by The Guardian shows that significant expenditure cuts were introduced in 2010, with the remaining budgets far more gradual in character. This hints at a clever strategy at the heart of austerity politics: introduce the majority of cuts in one credibility-building blast, implement the remaining cuts slowly so as to minimise the impact on social stability, but maintain the narrative of harsh cuts in order to maintain a line that neutralises the Labour opposition. These final two charts are in many ways the most important. That many people believe that the cuts are being done unfairly will, no doubt, be music to the ears of the Left. 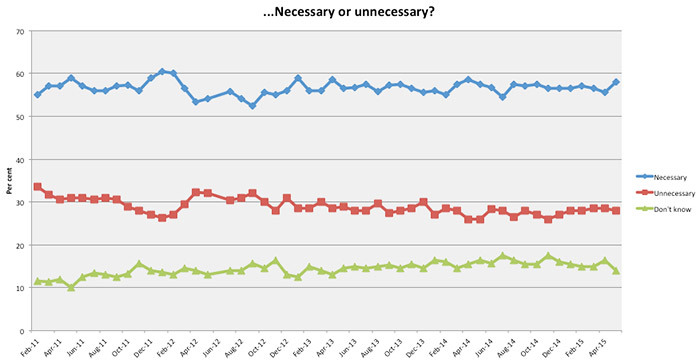 But I want to suggest that the ‘…Necessary or unnecessary?’ question is actually the most important of all, perhaps representing the closest of the six charts to some sort of barometer of austerity public opinion. As the chart shows, a majority of the British population believes that spending cuts to reduce the government’s deficit are ‘necessary’. It may appear unremarkable because it has remained so static. Yet it is this very continuity that is in fact remarkable. Believing that austerity is unfair and likely to worsen life may be negated somewhat by the belief that the austerity is itself a necessary intervention with no alternative. This is the ‘take one’s medicine’ phenomenon and hints at perhaps the central challenge for those on the Left: whether to sign up for austerity and accommodate the preferences of the majority, or launch a genuinely radical critique that pushes up to and maybe even beyond a Keynesian view and instead questions the economic and political basis for living within one’s means.